Not surprising storm for late this week now a non event here verbatim overnight gfs. It'll come back. Probably the typical big storm 10 days out, models lose it at 6 or 7 days, then find it again at 4 days out. jmanley32 wrote: Not surprising storm for late this week now a non event here verbatim overnight gfs. You guys never seem to understand me I said VERBATIM, I am well aware it means nothing I fully expect it to come back at some pt, also possible it doesnt though. We get ya, we're just re-emphasizing the point. 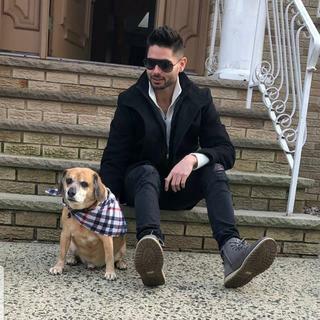 Amugs. LP off the Carolina coast Saturday?? oldtimer wrote: Amugs. LP off the Carolina coast Saturday?? 18z GFS has the storm back. Only lost it for 12 hours. Lol. Hope we can have some fun tracking this during the week! A lot of activity from Friday night through Monday on the GFS. I'm not sure it has it all figured out yet, but there will be a lot happening to keep an eye on this weekend. Right now it spreads things out as three distinct systems. Earlier it had everything kind of coming together as one, or two events. I think it will have a better handle on things by Thursday so for now not putting much stock in any one run. This month is shaping up to be a wet one, April showers, they ain't kidding! It seems every few days it's going to be wet. Between all the dampness and pollen with things starting to bloom, allergies are going to be awful! Right on cue 12z GFS comes north. Ahh 3 noreaster each a day apart!!! Please tell me that's a joke I've never seen that let alone in April. jmanley32 wrote: Ahh 3 noreaster each a day apart!!! Please tell me that's a joke I've never seen that let alone in April. It will never happen, one in a million 3 in April but if it ever did it would be something we could tell our grandkids about. 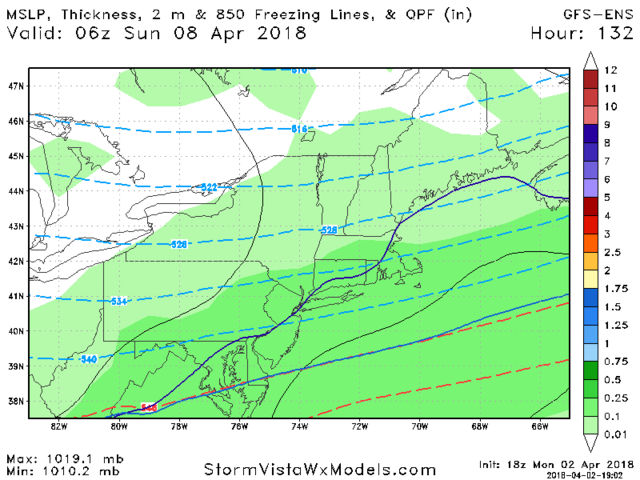 What the Euro, GFS and CCM are all showing for April is absolutely remarkable that we dont have to worry about temps for these next systems as depicted currently at h5 - I dont recall seeing such in April let alone a winter month. LOOK AT THIS - ARE YOU KIDDING ME FOR APRIL??? In all seriousness though, will the conga line of systems, I could see a lot of doubleheaders later this year. Heck, the Mets already have one scheduled for July after yesterday. I could see some more. They are scheduled to play in DC this weekend. (2) fresh injection of cold air. We have a fresh injection of cold air into the NE/N VA Fri nt into Sat. Sound the snow threat alarm for Sat into Sun. Earlier tweet shows the 500 mb and the area of concern." An impressive spike in the PNA ridge and we're still in a -NAO regime. Amazing what a +PNA/-NAO couplet can do, even in the month of April. We're likely to see another accumulating snowfall event this weekend. I like what I see. We're not far off from an even larger storm. 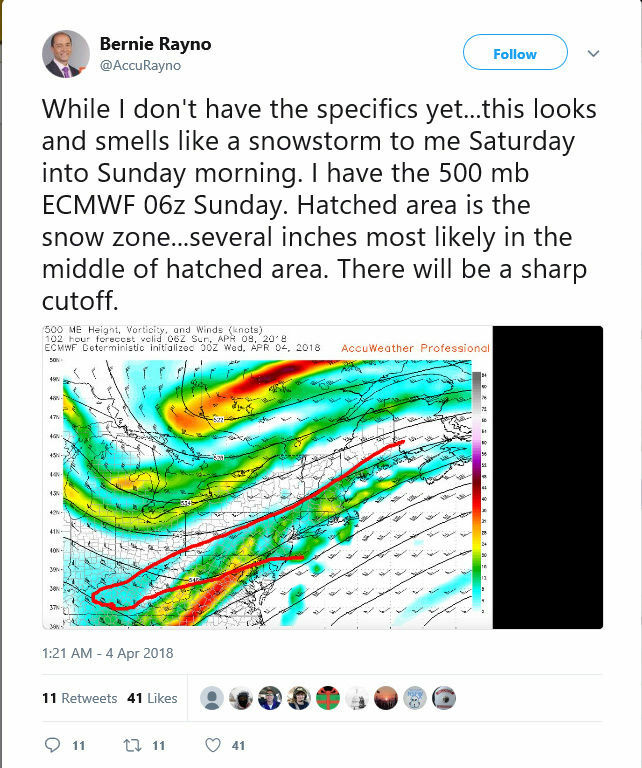 There is no phase on the GFS verbatim. If there was, it could have been an April Godzilla. The blocking may be too weak for the phase to come together, however. But it's close enough that it should be watched closely. Yes we have seen systems trend further north in tight esp since March. I have been watching pretty much all guidance "walk" this weekends snow threat slow but steadily north. This has not been erratic mood swings from the models where we have Frankzilla one minute; then a swing and a miss by 500miles south the next which makes this all more credidible. This is a system that started south and conts to slowly trend it north. Why? Because of what Frank outlined above. In the long and md ranges the full extent of the PNA spike and the influences of the N latitude blocking pattern well established gets focused on the modeling only in tight. This tells me this is a very real threat for significant accumulation (mothra-Godzilla potential) for asignificant portion of our board. 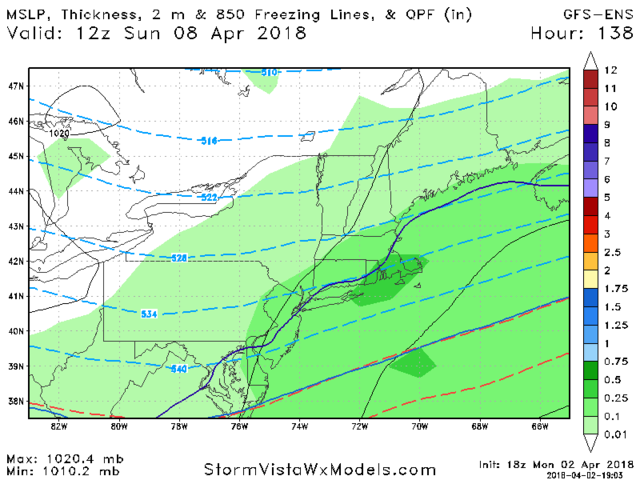 I’ve been looking at this April 7 time frame for over a week and other than a couple model run hiccups here or there, there hasn’t been a time when it didn’t look to have great potential. Now down to three days out I think we can say it’s officially moved from speculation realm to legit threat. 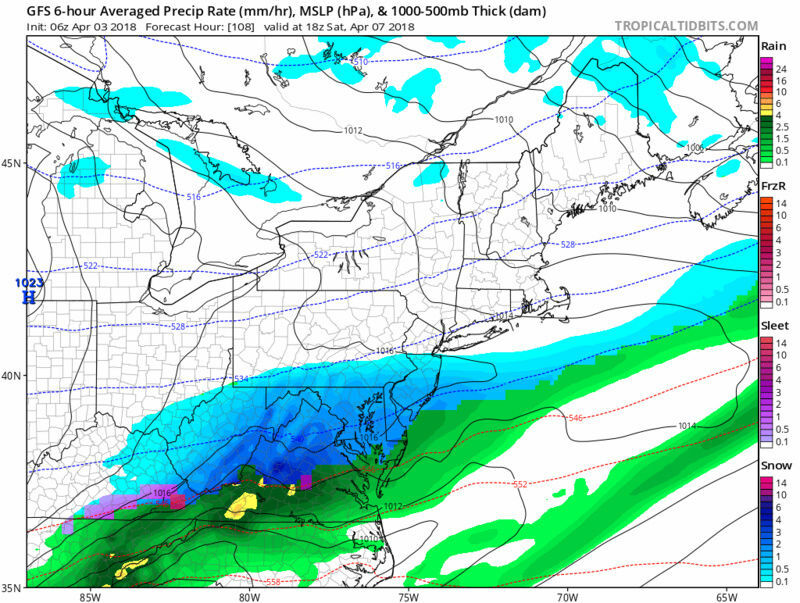 Timing as always in April is key for accumulation but there is no shortage of cold air for this.